Have you ever wanted to read someones aura? have you ever wanted to have a reliable repeatable system to do it? 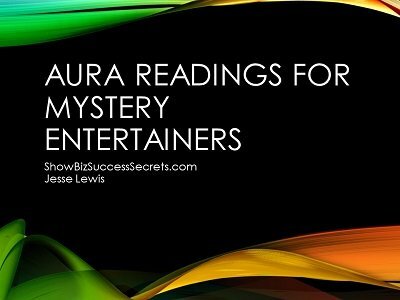 Well then Aura Reading for Nystery Entertainers is for you. Using a proven reading system with a few tweeks you will learn how to read auras quickly and effectively in about 1 hour. This system can be used to enhance any type of reading and give that something more to your presentations. It can be used live or over the phone to read the persons aura. It is repeatable years later and is amazing. This is simple, direct, and most of all stunning when performed in the right way. Your sitters will believe you are a real psychic!